^ MacIntyre, Donald (23 September 2000). 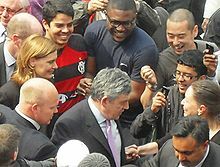 "Chancellor on the ropes; Profile: Gordon Brown". The Independent. London. Archived from the original on 23 January 2012. Retrieved 21 June 2009. (Subscription required (help)). ^ Grice, Andrew (4 April 2008). "Brown faces revolt over scrapping 10p income tax band". The Independent. London. Archived from the original on 6 December 2008. Retrieved 20 April 2008. (Subscription required (help)). ^ "Goldfinger Brown's £2 billion blunder in the bullion market". The Times. London. 15 April 2007. Archived from the original on 11 May 2008. (Registration required (help)). ^ Watt, Holly; Winnett, Robert (15 April 2007). "Goldfinger Brown's £2 billion blunder in the bullion market". The Times. London. Archived from the original on 11 May 2008. Retrieved 19 July 2009. (Registration required (help)). ^ Webster, Philip (2 July 2008). "Labour denies Keith Vaz offered 'reward' for backing government". The Times. London. Retrieved 2 July 2008. (Registration required (help)). ^ Russell, Ben (10 September 2007). 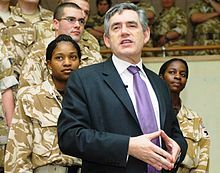 "'Jobs for every Briton,' says Brown in crackdown on migrant workers". The Independent. London. Archived from the original on 16 April 2009. Retrieved 25 September 2013. (Subscription required (help)).